ROSE GOLDEN SHIMMER BATH SET by Accent Plus home decor, jewelry, decor, decorations, electronics, fountains, floor mats, art glass, vases, garden essentials, fireplace screens. 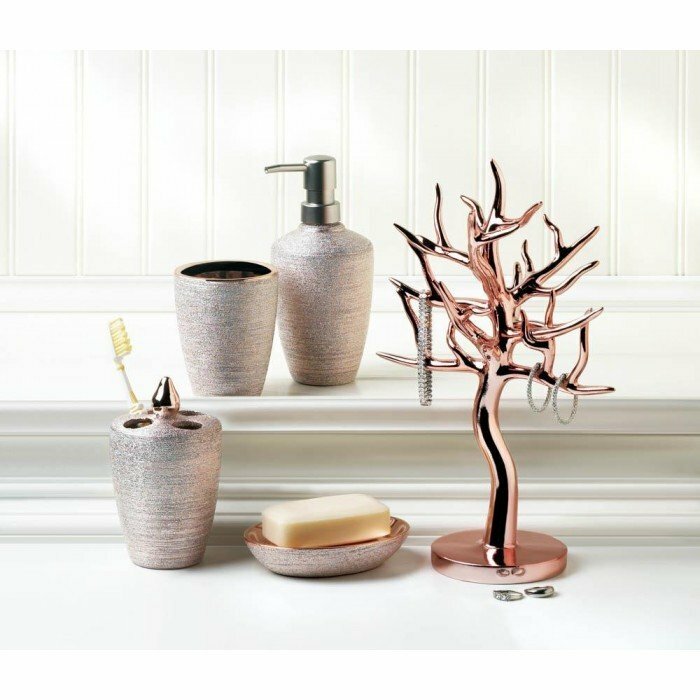 Chic rose gold shimmer will make your bathroom a stylish oasis! This lovely bath accessory set includes a soap/lotion pump, toothbrush holder, soap dish and cup. Lotion dispenser: 3.375" x 3.375" x 7.375" high, tumbler: 3.25" x 3.25" x 4" high, toothbrush holder: 3.75" x 3.25" x 5.25" high, soap dish: 5" x 4" x 1" high. Material(s): PORCELAIN. Weight 2.86 pounds. Dimensions 3.38" x 3.38" x 7.12".